Arizona has long been a place where women could break barriers and serve as pioneering leaders at all levels in the community. For 30 years, the Greater Phoenix Chamber of Commerce has recognized the profound impact of female leaders in Phoenix. 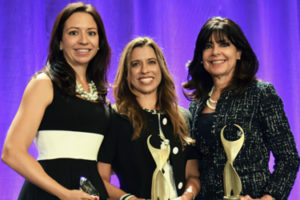 Women, including the 50 ATHENAs honored during the past three decades, shape Phoenix every day through their work in industry and in the community. By forging a path for themselves, and others, women—like all of the ATHENA recipients—have built an innovative city and greatly contributed to keeping Phoenix united as a community focused on growth, strategic development and a quality of life that is inclusive of all people. One woman working toward this goal is the 2017 ATHENA Public Sector Recipient, Michelle Just. Just, the CEO & President of Beatitudes Campus, shared her heart and her purpose with 700 people at the ATHENA Awards. Women, like Berisha and Just, play a vital role in moving Phoenix forward. Women lead in so many ways, all of which help to make the community stronger. Mi-Ai Parrish, the 2017 ATHENA Private Sector Recipient, accepted her award by defining ATHENA and spoke to the importance of women in business. In her acceptance speech Parrish, the President of Republic Media, alluded to how those contradictions are what make women economic powerhouses. It is through the hard work and dedication of women that Phoenix has flourished. From female-led companies and to groundbreaking women who have conquered challenges in business and government, it is women in business and in the community who are moving Phoenix forward.